Hello Everyone, so happy to be joining Altenew to their 5th Anniversary. You should have arrived from Bea Valint's Blog. For this project I used the oldie buy goodie Beautiful Day stamp set. For the sentiment, I used More Than Words stamp set. I stamped it with gold glitter embossing powder. For the dots you see, that is from using Copic Markers to add interest pm the background. For the flower images, I also added some Diamond Stickles to give that glittered card even more special. You picked a great oldie, but goodie to use for this card. But you cannot go wrong with any of Altenews Florals, big or small. They just have a great way of creating these sets. I like the bold flower with the soft background and the touch of black & white of your card! Awesome job! I really like that red and pink combination you used. Very pretty. Beautiful Day is one of my favs. You made a beautiful card. Beautiful. Love the use of the stickles for dimension! I’m so in love with Altenew!! Can’t earn money fast enough to buy all the ones I want but I do have quite a few … about 70 sets to be exact! So happy to be able to purchase them here in Germany!! Congratulations Altenew! And thank you Joni for all your ideas and know-how!! gorgeous card! love the new stamp sets. Beautiful card. Vibrant colors. Thanks for sharing. Your colors made the flower come alive - beautiful! Happy anniversary Altenew! I love this card! Gorgeous! Happy Anniversary to Altenew! Your flowers are so beautiful. I love the stickles and the gold embossed sentiment. I love the little bits of paint splatters too. Your little touches really complete this amazing card. Thank you! Your card and flower turned out awesome...the color of the flowers are fantastic. Super pretty cards!! Thanks for sharing!! Beautiful! Happy Birthday Altenew! Love your cards. Absolutly Stunning!! Love Love Love!! 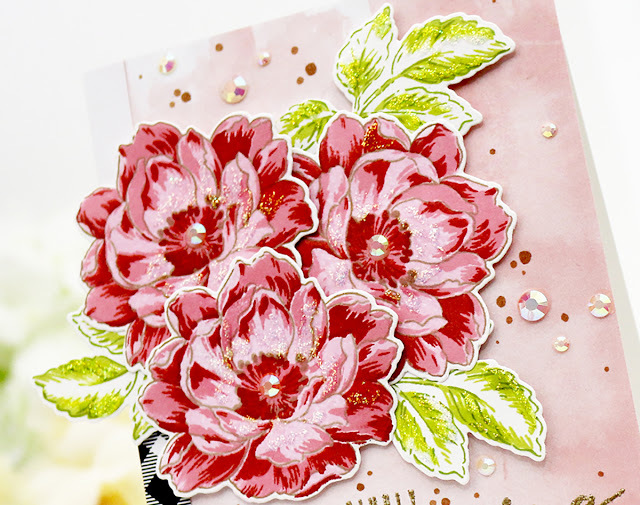 Can't go wrong with Altenew layering floral stamps...great card. Gorgeous card design Joni! Love this stamp set, you did a fabulous job bringing this older set back in to my crafty mind! Altenew sets are ones I cannot part with, they have become an addiction and precious collectibles to me ;) ! Thanks for the inspiration and happy anniversary to Altenew! Love the Beautiful Day set. I still use it regularly. Thank you for the ideas. Very pretty ! Happy Anniversary Altenew , Very pleased to be a part of your success 5 years ago 🌷 , much more success to come . Great use of color ... love your card. Happy Anniversary Altenew! This stamp set may be an oldie but it is still one of my very favorite stamp sets of all time! Your card is gorgeous! This card is just beautiful. It should teach us to reach back into our stamp drawers more often. 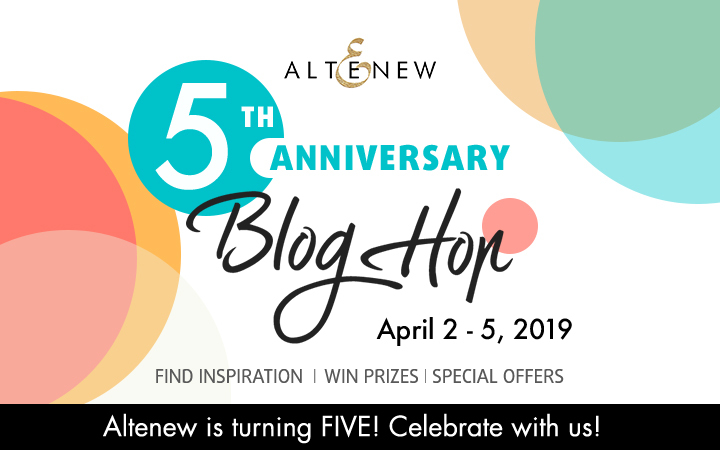 Happy 5th Anniversary Altenew. One of my favorite stamp sets! Beautiful card and I love the pink flowers with your gorgeous background. So pretty! 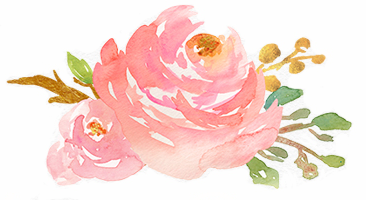 Those flowers really pop off the page, especially over that soft pink background. Lovely! Wow a great card Happy Anniversary Altenew! Love your products. Gorgeous card Joni. The coloring is out of the world fantastic! Love it! So, so pretty! Happy Anniversary Altanew! Altenew flower stamps & dies are for forever use, they are so versatile & truly beautiful no matter if you use inc pads, watercolors, color pencils or markers. Gorgeous flowers, the bit of glitter really adds a nice touch. Love your beautiful card. Altenew designs never go out of style! Beautifully colored and I love the sparkle and bling! HB Altenew! Stunning! Beautiful colouring! Thanks so much. Happy Birthday Altenew! Love the card! Gorgeous flowers. Thanks for sharing. Beautiful! Love the colours used. Totally rocking this gorgeous stamp! Nice! That set is a must get. Lovely card and a beautiful sentiment. Love your style and your techniques are amazing. Gorgeous work. I can't wait for your next post. Love the red flowers from Beautiful Day set. Your card is delightful. Happy Anniversary Altenew. Love the colors you used. The flowers pop off the page. Wonderful sparkle and texture on your card...lovely! This is such an iconic stamp set for me - it just screams Altenew! The unusual red color is so pretty Joni! Whew! If you are talking about that card it is simply amazing!! Love the color. Your red flowers with the gold embossing are stunning!! Love the background you created too. Gorgeous card! Great way to showcase this Altenew stamp set. Really love this set and your color combination for the flowers! Love the colors - beautiful card!! Lovely depth on these pretty flowers! Love the stickles on your card. Such an elegant card - with such great Altenew products! Stunning card. The colors (and your coloring) are amazing. A very beautiful card! Stunning! Wow this almost looks like embroidery. Beautiful coloring. Your coloring of the beautiful day stamps have turned them into a masterpiece! What dimension, they practically jump off the page. I aspire to be able to color as well as You. Congratulations! Loved your card. The florals just popped off the page. The colors were so vibrant. Great colors on this, amazing! Wow - That is a beautiful stamp set and card! Oh so beautiful card, with one of my favorite stamp sets! I love your card. Thanks for celebrating with Altnew. This is gorgeous. I LOVE the coloring of your flowers. This is one of my favorite sets!! I agree...your card is simply amazing! I would love to know the colors used on these beautiful flowers. Beautifully stunning card, love the vibrant red and pink colors! Stunning COLORING and I love the splatters in the background! Happy Birthday Altenew! 5 years! WOW! Amazing. THANK YOU for all your inspirations!! Amazing colours and I love the glitter you've added!! Your card just turned out beautiful. I love the colors in your flowers. Thank you so much for sharing your card today. Your beautiful day gold and awesome red flowers are SPECTACULAR!!!! So pretty and gorgeous! I love this. DO you have a video on this?! I would love to see your creative process! Just truly amazing your work!!!! Happy 5th Birthday to Altenew, your card is really lovely! Absolutely stunning. This card is beautiful. Wonderful use of accents to highlight your work. Thank you for sharing your talent! beautiful day is one of my favorite stamp sets. great cards. thanks as always for sharing. Tremendous card! The colors are very unique, but also very beautiful! Love this bright, beautiful card!!!! Pretty card - thanks for sharing! Stunning card. Thank you for sharing your talents with us. So pretty! Love the color combination that you chose! Tricia Podmore here, have to tell you that you nailed that card! Love your choice of colors. You are sooo creative and talented. This is gorgeous ! Love the colors! Love the colors. Altenew is the best. Love your red and pink combination you used. Very pretty! Gorgeousness! Lovely all the way. Thanks for the inspiration. Very pretty card! I love the flowers! How beautiful... thanks for sharing this awesome card for the Altenew hop! Oh yes. The sentiment is just perfect for this card - simply amazing. Love the flowers and the way you colored them amd the golden lines. Your flowers are gorgeous! Love the addition of the stickles. I'm a huge fan of anything glittery! Love your card and the coloring it is a true beauty. So beautiful, Joni! I love this! Thank you for sharing! Amazing card with my favourite stamp set! Beautiful Day is one of my favorite stamp sets - this is lovely, Joni! I really should use my stickles more. Your card is beautiful and I really like all the glitter and shine. Beautiful card and flowers,Joni. This is one of my favorite stamp sets. Love all the details you put on your card. Really beautiful, you did a lovely job. Thanks for sharing your creativity! Pretty card! I love the glittery accents! Always a favorite ! I love how you layered it all and the colors are so elegant! Nice to see an old favorite stamp used. Beautiful card, love the way you have colored the flowers. Wow! This is beautiful! I love the good embossing and touch of black added to the card .It really makes it pop! Beautiful card! Your coloring is gorgeous! Love the addition of the black and white on the edge to bump it up a notch. Fabulous! Happy Anniversary to Altenew! 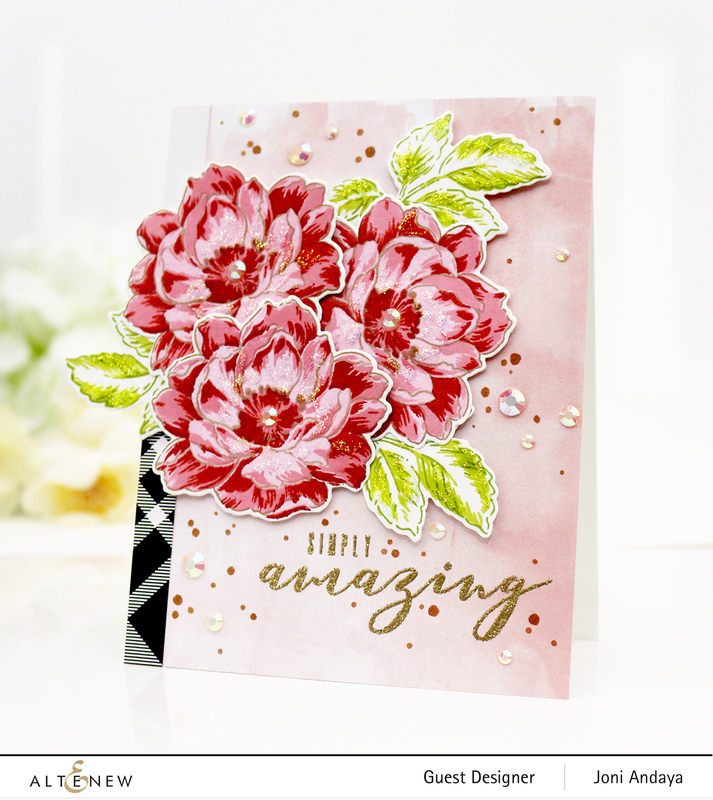 Your card is "Simply Amazing" as are all of the altenew florals. Beautiful. Love your card, perfect colors! Altenew florals are the most gorgeous! Can't go wrong there. Beautiful card and thanks for sharing! Congrats to Altenew!!! Your card is exceptional and the coloring is a real attention getter. Frame worthy. Gorgeous card Joni, love the colours with the hint of gold. What a beautiful card. You really can't go wrong with the Beautiful Day flowers, but you managed to elevate them even more! The stickles accents so fun, and I really like the little stripe of black and white paper on the side. What a great choice! Thanks for sharing with us. amazing shading, love Your card. Beautiful stamp set with great use of color. The color choices are spot on. Thanks for sharing. Beautiful flowers. I love those colors they are so dramatic. Beautiful inspiration using one of my all-time favorite stamp sets! Thank you! Your card is pretty amazing, too! Love all the dimension and sparkle with the vibrant color. Well done! Beautiful card and one of the best Altenew stamp sets. Congrats to Altenew, and congrats to the design team on so many beautiful projects! Joni, your card is so gorgeous! Those flowers are just stunning! Thanks for sharing your awesome creativity with us! That black checked (plaid) just adds so much drama to your card. Excellent! Such a beautiful card. Love the colors and just the right amount of sparkle! I'm so excited to have so many more talented people like yourself to get ideas from. 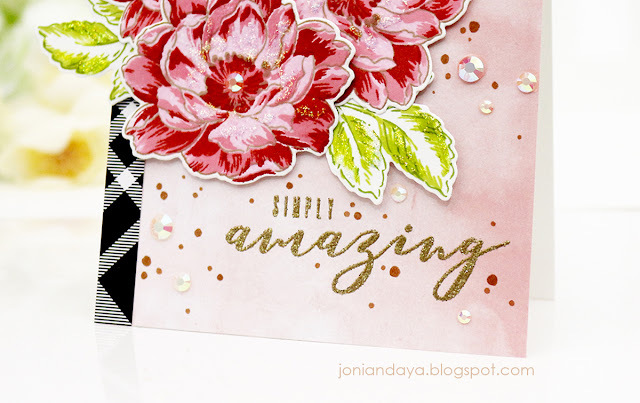 everything about your card is so beautiful, Joni! Your colors are so beautiful along with the stickles and gems. Such an outstanding card! Beautiful card! Love your color choices! I am so excited as I just ordered the Beautiful Day stamp set! Your card is lovely! So very pretty. Well done. Lovely card with those gorgeous blooms! How beautiful! Thank you for sharing your talent!